My trip to Annapurna recreated my emotional and creative bond with Himalaya. On a more practical level, I refined how to plan a photo expedition in the best possible way to overcome the problems arising by using a large format camera and traditional films. In May 1995 I reached the top of Mount Everest with Christian Kuntner, without oxygen, climbing from the Tibetan side along the North Col route. I had never been on the Nepalese side. The possibilities for photography are uncountable and all very interesting. 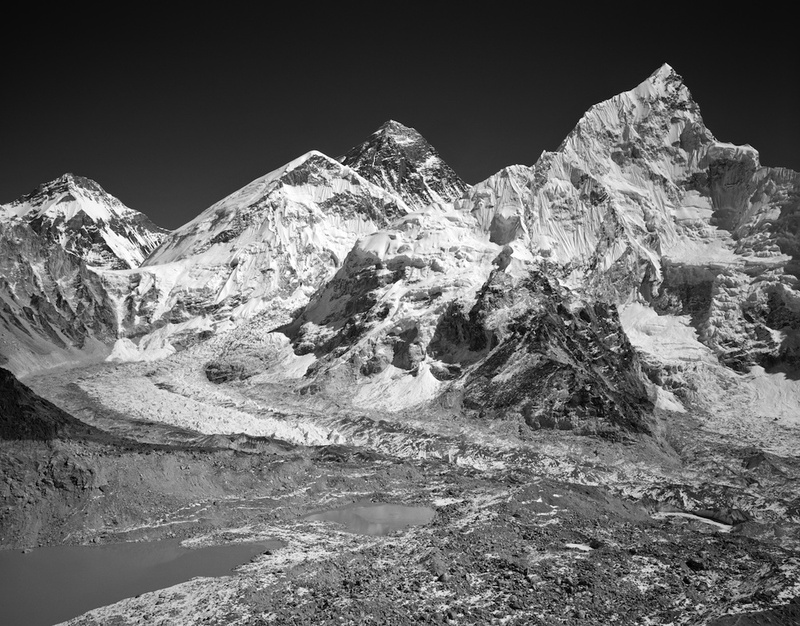 Along the Khumbu valley there are many 6,000s and 7,000s which have amazing shapes – Ama Dablam, Pumori, Cholatse, Taboche, Nuptse – and of course the 8,000s: Everest and Lhotse, and also the not too distant Cho Oyu, that can be reached from Khumbu by the Cho-La Pass. This area is a true heaven not only for mountaineers and trekkers, but also for photographers. During this trip, from October 20 to November 20 2014, the weather was excellent for the whole time. The sky was always blue and clear, and the late Fall light was always pure and resplendent. The job done on that occasion is very gratifying for me, since I obtained very high quality results. I must confess that the huge South face of Lhotse was particularly impressive, as it was to see again, after so many years, the highest mountain in the world. To watch again Cho Oyu, that I climbed in 1993 with Krzysztof Wielicki by the Polish Pillar Route, was also a very emotional and positive experience. I feel much gratitude for the porters who were with me in this expedition: without them, their patience and help, I wouldn’t have been able to bring home the many negatives that, in the next years, will be transferred to a sheet of gelatin silver paper, trying to capture the magic atmosphere of this world, which is a unique one and connects the spiritual and the material borders of our human experience. Today the Himalaya, and the Khumbu valley more specifically, are experiencing drastic changes which are crucial for the future survival of the people who live in these regions and their fragile ecosystem. The many thousands of tourists who every year walk along the trails of the Himalayan valleys of Nepal are introducing a dramatic revolution in the lives and habits of the Nepalese people, and the anthropic pressure of the high altitude mountaineering, which is constantly increasing, is threatening this peculiar region in an irreparable way. Here again we confront ourselves with the major challenge of our times: to learn how to combine the legitimate aspirations of those who wish to improve their life conditions and the need to preserve our natural habitat. This is vital, so that the future generations too will be guaranteed a life which is both sustainable and respectful of our planet’s resources.